Modesto CA, (May 12th and 13th) – Habitat for Humanity Stanislaus, local businesses and community will work alongside Lowe’s volunteers and our construction crews for Habitat for Humanity’s 10th annual National Women Build Week, May 6-14. Habitat’s National Women Build Week invites women (and the community) to help make a difference and devote at least one day to help build decent and affordable housing in their local communities. More than 17,000 women and men, including Lowe’s Heroes volunteers, are expected to volunteer at construction sites across the country as part of Habitat’s 2017 National Women Build Week. In Stanislaus county volunteers will work together to build a home in the Habitat for Humanity community of River Vista in Modesto. Lowe’s helped launch National Women Build Week in 2008 to empower women to advocate for affordable housing and spotlight the homeownership challenges faced by many. Each year, Lowe’s provides the support of their employee volunteers, Lowe’s Heroes, and conducts how-to clinics at stores to teach volunteers construction skills so they can feel equipped to take part in the builds. Lowe’s Heroes will be among more than 100 volunteers joining to help build decent, affordable housing in Stanislaus County as part of National Women Build Week. Lowe’s donated nearly $2 million to this year’s National Women Build Week, including a $5,000 store gift card to Habitat for Humanity Stanislaus. Since 2003, Lowe’s has committed more than $63 million to Habitat’s mission and helped more than 6,500 families improve their living conditions. 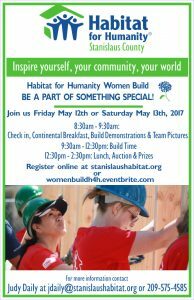 For more information on Habitat for Humanity’s Women Build program or register to join us on May 12th or 13th, go to our website at www.stanislaushabitat.org and click on Women Build. Our mission is more than building one home at a time, for one family. We seek out areas where multiple building sites are available, the sense of community is strong, and residents want to improve their living situation. Habitat for Humanity was founded on the conviction that every man, woman and child should have a simple, durable place to live in dignity and safety, and that decent shelter in decent communities should be a matter of conscience and action for all.